New executive members of the Karen Refugee Committee (KRC) have called for the new NLD government to put the issue of refugee repatriation on its agenda. The KRC executive said the new government had to ensure refugees could ireturn in safety and with dignity when the time came. 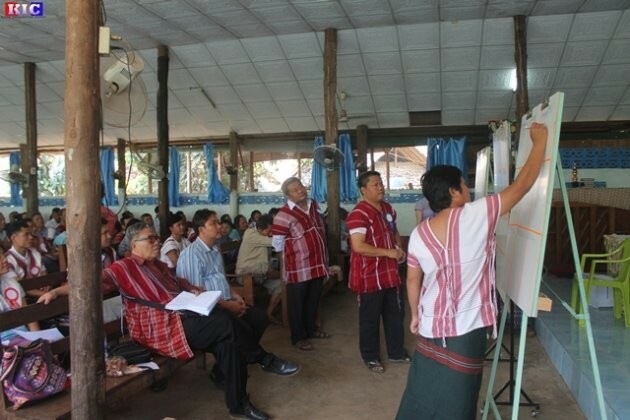 The KRC call was made following the election of the new Karen Refugee Committee’s executive members on February 18, 2016 at Mae La refugee camp on the Thai-Burma border. Saw Robert Htwe, the re-elected chairman of the KRC told Karen News that refugees should be given support and recognized as full citizen when they return. Refugees are struggling to cope with the cuts to international humanitarian aid for the nine camps along the Thai-Burma border. Refugees in the camps are finding the day-to-day survival more difficult and the uncertainty over repatriation has increased anxiety the camp communities. Naw Dah Dah, from the Karen Women Organization social affairs department told Karen News that despite refugees being told that they will not be sent back, the decreased aid to the camp makes them feel like they are being ‘pushed’. The KRC said that the Burma government need to tackle issues like security and safety assurances for the refugees. Refugee communities indicate that they hold high expectations that the new NLD government will pay attention to their plight. Saw Robert Htwe, the KRC chairman, said that the new government still needs to plan for the refugees return. Saw Ywar Baw, the vice president of the Mae Ra Mo refugee camp told Karen News that unless the new government takes on the refugee issue, the problem will continue to drag on. The Karen Refugee Committee is divided into various departments such as health, education, social, livelihood and management to best coordinate services in the camp. Recently, as part of the preparedness for refugee return, KRC is working more on vocational education training. KRC holds election every three years to choose their executive committee members and this year, many former committee members were re-elected to their same post. At the latest election, Saw Robert Htwe was elected as chairman, Saw George as the vice chairman, Saw Pwe Say as secretary, Saw Eh K’lu as the joint secretary and Naw Blooming Night Zan as advisor for finance. KRC was formed in 1984 to manage and coordinate service provisions to the Karen refugee camps along the Thai-Burma border.